Mischa Kuball. Platon’s Mirror, (2011). 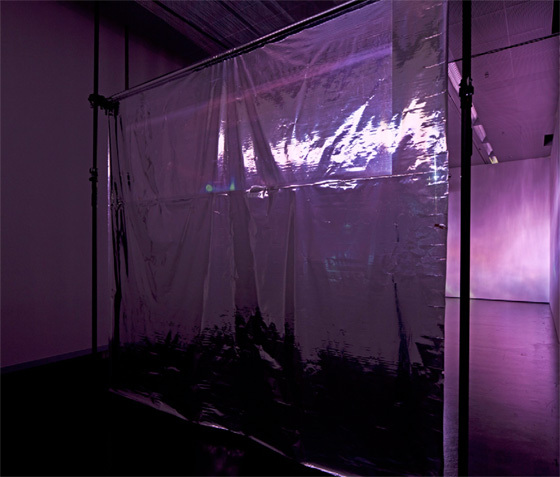 Installation view at ZKM, Karlsruhe © Onuk. Mischa Kuball works with light’s socio-political dimensions across a range of gallery exhibitions and public space projects. In Platon’s Mirror Kuball draws upon one of the most influential stories within European literature: Plato’s allegory of the cave in Book 7 of The Republic in which the philosopher draws a distinction between two forms of reality: the reality of the visible world and the (true) reality of ideas. 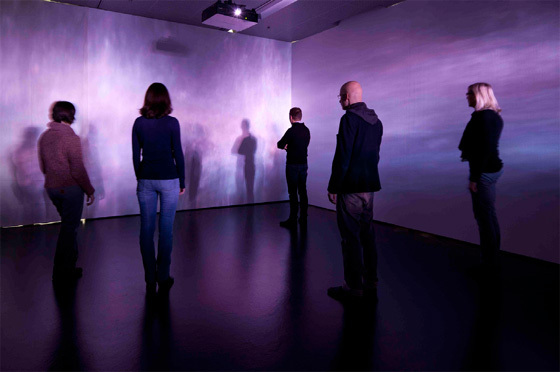 Kuball presents simple yet highly effective installations using projectors, silver foil, photographs and videos that create perceptual and experiential spaces analogous to that of Plato’s cave. In doing so he translates the complex relationships among light source, reflection, silhouettes, and representation into seemingly endless stages of mediation, within which reality is continually newly constituted as the reality of its reflection. Mischa Kuball’s engagement with the allegory of the cave takes place in an era in which the problem of reality is barely considered in philosophical, sociological or political terms. The current fascination with the ‘performativity’ of the real apparently neutralises the issue of what within reality might actually be considered ‘real’. Kuball questions whether the problem of reality can so easily be discarded by declaring reality as only socially constructed. Questioning whether ratio and the intellect are still useful when it comes to comprehending a distinction between reality and apparition, Kuball’s work can not only be seen as an attempt at re-actualising Plato, but moreover as an attempt to question anew the classic connection between the metaphor of light and the idea of Enlightenment. Mischa Kuball: Platon’s Mirror results from a unique partnership between the artist, Artspace, ZKM | Center for Art and Media Karlsruhe where the exhibition was shown earlier this year, and the Goethe-Institut who are touring the project internationally. An accompanying Platon’s Mirror reader designed by Christoph Keller is also being prepared for publication in Germany. Edited by Andreas F. Beitin (ZKM / Center for Art and Media Karlsruhe), Blair French (Artspace), and Leonhard Emmerling (Goethe-Institut) it will contain texts by Andreas F. Beitin, Hans Belting, Bazon Brock, Martina Dobbe, Leonhard Emmerling, Blair French, Ursula Frohne, Wulf Herzogenrath, Friedhelm Mennekes, Yukiko Shikata, Peter Sloterdijk, Wolfgang Ullrich, Bernhard Waldenfels, John Welchman, Peter Weibel, Friedrich Kittler, Horst Bredekamp and Duncan White. Mischa Kuball: Platon’s Mirror and accompanying symposium are presented in cooperation with the Goethe-Institut Australien.